Lizzie's mom has to undergo cancer treatment, so she asks Lizzie where she would like to spend her summer. Lizzie chooses to go to her uncle Davy's renovated schoolhouse home in the Adirondacks, near where her good friend Matias, an immigrant from El Salvador who has proportionate dwarfism also lives. Not long after Lizzie arrives, however, two dangerous convicts escape from the prison, kidnapping both Matias and Uncle Davy and leaving Lizzie entirely on her own. Determined not to lose the people she loves most in the world, Lizzie sets out to bring them home, not realizing how dangerous this plan really is. This middle grade novel is told in the form of a victim impact statement given by Lizzie to a listener whose identity is unknown to the reader for much of the book. This, combined with the suspense of the kidnapping and rescue mission, would make for compelling reading all on its own. But, as with Kephart's 2016 young adult novel, This is the Story of You, it is the gorgeous writing style that makes this book truly stand out as original and beautiful. Many middle grade books seem to have a singular generic voice, which can make it hard to differentiate one story from another. This one, however, is not just a memorable story, but a distinctive piece of writing. What Kephart has to say becomes more meaningful because of the way she says it. This book is filled with moments where the author employs just the right detail in just the right way at just the right time for maximum emotional impact. I was genuinely surprised several times when I suddenly felt like crying over some turn of phrase or turn of events in the story. It's been a while since a book got a true reaction out of me like that. The ARC of this book did not include the final full-color paintings which serve as the book's illustrations, but the preview images shown on Edelweiss are beautiful, and they do much to enhance the mood of the book. Art plays a major role in the stories of both Matias and one of his captors, and having Matias's paintings represented in the book adds a lot to the reader's knowledge of his character. . The fact that the illustrator is the author's husband, who is himself Salvadoran, is also a nice touch. 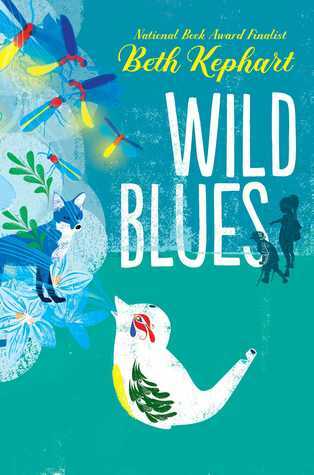 I would put Wild Blues in a category along with Lauren Wolk's books - that is, literary fiction for the middle school reader who likes description and action, strong character development and meandering reflections about life. It's certainly not going to resonate with every child, but there are definitely readers out there for whom this special book will be an instant and enduring favorite. It certainly is for me.